Incredible as it may seem, the earliest design for a jet engine was in 1863 in France. The first patent for a for a jet engine was issued in 1921 to another Frenchman. Frank Whittle took out a patent in 1930. However, the first operational jet engine was patented in Germany in 1935 by Hans Joachim Pabst Von Ohain. The first flight of an aircraft with jet engines took place on 8/27/1939. This was a Heinkel 178 flown by Erich Warsitz. The engineers at Junkers decided to start afresh because of the inherent problems with both Whittle's and Von Ohain's centrifugal designs. They came up with an Axial Turbo Jet engine, the Jumo 004, which is essentially what has been used in all jet aircraft since then. The authors start their book on the Me 262 Schwalbe (swallow), by going back in time to the beginning of jet engines. They then go into the thinking and design work that went into the Me 262. The Me 262 was probably the biggest milestone in flight since the Wright brothers. How would you feel, if you were an Allied pilot, to see a plane whiz past you at 100 miles per hour faster than you could fly? The Me 262's maiden flight was on March 29th 1942. The first Jumo motors weren't available until June 1st 1942. After Adolf Gallands first flight in a Me 262 he said "it was as if the angels were pushing you". The book continues with all of the design changes, tricycle landing gear, and all of the different armament configurations discussed. The idiotic Fuhrer directive about all aircraft being able to carry a bomb load is brought up. The authors show that the main reason for the delay of the Me 262's deployment was because of the plane and engines being revolutionary. The plane itself was a marvel, but the engines were always its Achilles heel. Acceleration and deceleration had to be slowly and carefully applied or the engines would flame out. The engine's life span was only 10-25 hours. This was due to Germany not being able to produce the exotic alloys needed to deal with the intense heat of a jet engine. The book takes us back to Hitler with a very interesting conference about fighter production for the Luftwaffe on Mat 23rd 1944. Hitler wasn't apparently too interested until the Me 262 was mentioned. At that point he asked "how many of the Me 262s already manufactured could carry bombs". When Field Marshal Milch tells him "none" he explodes. Various figures at the meeting try to talk Hitler into the idea that the Me 262 is a fighter through and through. Hitler abuses Adolf Galland and Milch about it. Then Milch blurts out "mein fuhrer, the smallest infant can see that this is a fighter, not a bomber aircraft". I imagine you could hear a pin drop at that moment. By this, the authors show that the Me 262 fighter version was in production, if haltingly, by May 1944. On August 17th 1944 an allied bombing raid on Regensburg caused serious damage to the Me 262 program. Four hundred staff were killed and the facilities were heavily damaged. 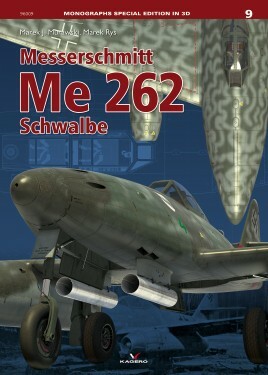 The book continues with a listing of all production and experimental Me 262s. Then it continues with the complete history of all of the Me 262 sorties during this phase of the war. This part of the book takes up the first eighty pages. The twenty pages that follow are scaled drawings of every planned or flown Me 262. The next eighty pages are a modeller's and flight simmer's dream. These eighty pages are of computer generated detailed pictures of every single part of a Me 262, from tail to nose and everything in between. The next section is small at fifteen pages, but these are full of pictures of an actual restored Me 262. The last twenty pages are computer renderings of side or top and bottom views of all the different paint schemes, etc. Unbelievably, with everything else the book already provides, there are two separate fold out line drawings of the Me 262 one at 1:32 and the other at 1:48 scale. This book is truly a wonder of prose and art. Any and every thing about the Schwalbe is here at the readers fingertips.